Warning! This review contains quite a few spoilers! There is always a tricky risk of too much of a good thing. Dead Drop was advertised as a conspiracy thriller featuring characters from X-O Manowar, Unity, Archer and Armstrong, and Quantum and Woody. But in the past year, we've had a lot of Valiant crossovers. Armor Hunters, Delinquents, and The Valiant. 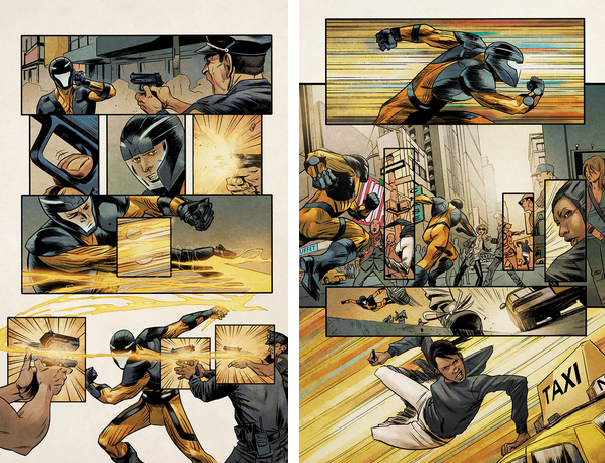 Plus, Unity is a monthly book that also features a cross section of the Valiant universe. All of those books are very good, but I definitely worry about oversaturation. So when I first heard about Dead Drop, I was cautiously optimistic. Dead Drop is the story of a terrorist group that has come in possession of an alien virus (which seems to have some connections to the Vine). 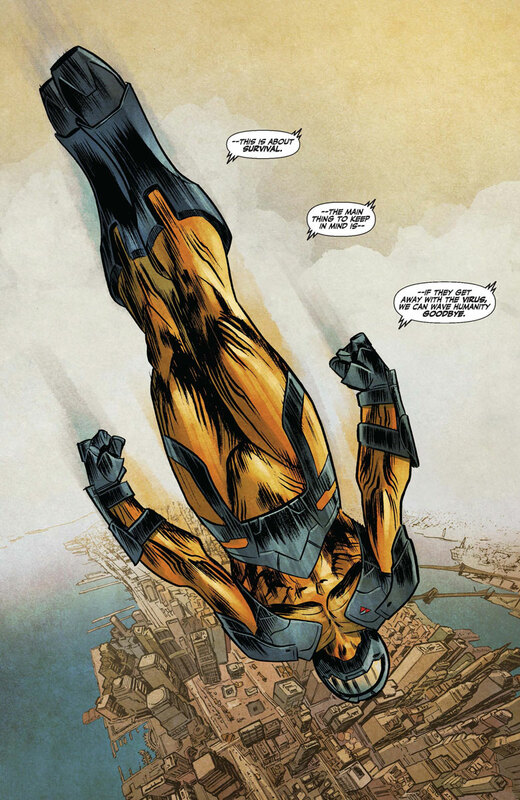 In the first issue, X-O Manowar chases one of the terrorists through the streets of New York to try and recover the virus. X-O also has to fend with NYPD, who have been told that he's an alien imposter who needs to be stopped. The terrorist manages to get away, but X-O has been infected by the virus...seemingly along with a lot of civilians. What I loved most about this comic is that it is non-stop action. Typically when a comic starts with an action scene, about halfway through the issue, we have a flashback that slows everything down to tell us how we got to this point. Instead, Ales Kot keeps the action going through the entire issue, telling the story via a conversation over the comms between X-O and Neville. You get the exposition you need without having to have the story interrupted. I thought this was a great choice, and it helped ensure the intensity of the issue never stopped. I also liked that this was a very different type of story for X-O. When you think espionage, X-O wouldn't be the first character you typically think of, but he worked perfectly for this issue. In order to recapture the virus, X-O couldn't really cut use on all his powers, so he was forced into a lengthy chase sequence. He also didn't want to hurt police officers who were just trying to do their job. It was great to see X-O have to try and solve problems without being able to rely on his brute force. This provided us with a very different look at X-O. The issue was also really self-contained. Other than Neville, we don't get to see the other characters who are supposed to show up in Dead Drop. I suspect each of them will be getting their own focused issue, which is a pretty cool way of telling the story. Though I will admit, my first instinct is that I don't know if Detective Cejudo can headline a story by herself. But, I suspect Valiant will prove me wrong as they usually do. I also thought that this issue was a great place for new Valiant readers to jump on. With all the books and characters, Valiant can be very intimidating, especially since it's not like there are a lot of TV shows, movies, or cartoons that can introduce you to the characters (other than Shadowman). But, Dead Drop gives you everything you need to enjoy and appreciate this story. The art on this issue was a bit of a mixed bag. Some of the scenes looked great, but there were other panels which were real light on details, or featured characters in real awkward poses. But, for the most part, I thought Adam Gorham was able to keep the story moving at a fast pace, and I loved the action and chase scenes throughout the issue. I will admit, I am not 100% sure why this story couldn't just have been told as an arc in Unity. Like I said earlier, I worry that Valiant is getting a little oversaturated with crossover stories. The crossovers are usually pretty self-contained where you can get away with just buying a four issue mini-series, but it can get a little overwhelming for the reader. And we have Book of Death starting in just a few months too which seems to be bigger on scale, much like Armor Hunters was. Valiant isn't quite as bad as Marvel or DC, but I really don't want them even remotely heading in that direction. All in all, this was a real good first issue. X-O and Neville were written perfectly, the terrorists seemed like a worthy threat to involve a good chunk of the Valiant universe. And you have a real good jumping on point for anyone who wants to check Valiant out. Which you should! They are putting out terrific comics each and every month, and Dead Drop is another great one. I did think the art was a little inconsistent, but the fast pace story and characterization more than made up for that for me. Fast paced story which showed us a very different side of X-O Manowar. A compelling story that used the characters real well. Very friendly for new readers. Is it worth your $3.99? While Dead Drop wasn't quite as good as The Valiant, it is still a very good read. If you are interested in checking out Valiant, it's definitely worth picking up. Review: Bobcat Goldthwait's Misfits & Monsters- Episode 5 "Mermaid"